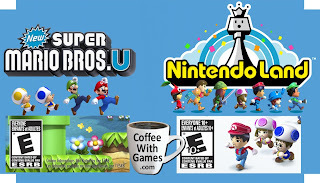 Coffee With Games: New Super Mario Bros. U to have online multiplayer? 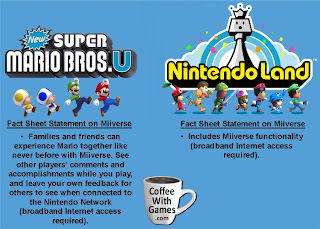 "Online Interactions Not Rated..."
Look at the two boxes for New Super Mario Bros. U and Nintendo Land in the image above. Do you notice anything significantly different between the them? If not, take another look. 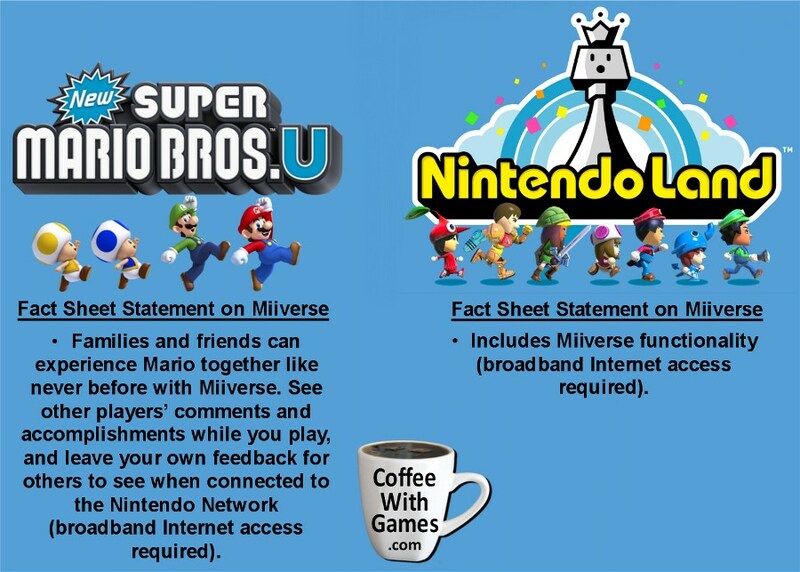 So, why would one box have the text, and not the other if it is just talking about Miiverse? 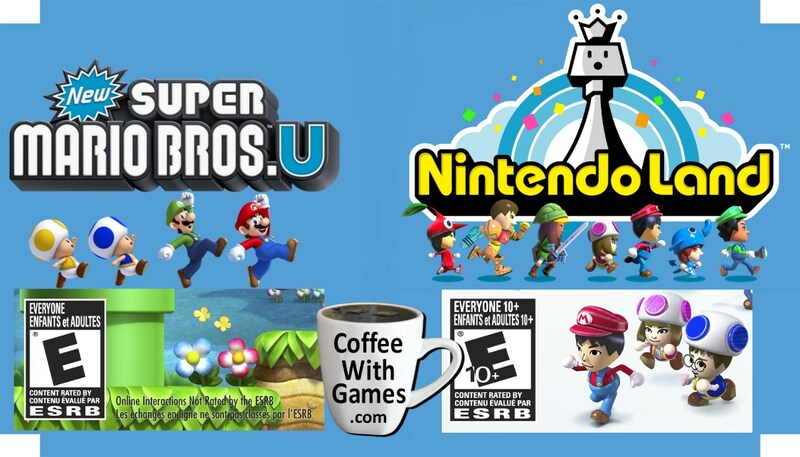 At the Wii U Preview event in September, Nintendo's Bill Trinen said of Miiverse, "...we're gonna go into more detail on Miiverse in New Super Mario Bros. U and other games, as we get closer to launch." 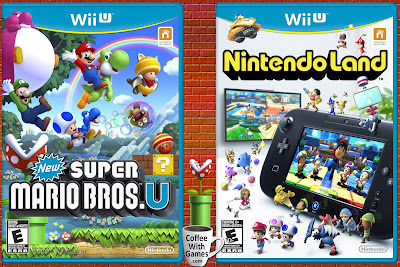 If you are still haven't spotted the difference on the boxes, look to the right of the ESRB's "E" logo on NSMBU's box. The small black text next to the ESRB rating says, "Online Interactions Not Rated by the ESRB". Not just in English either, "Les échanges en ligne ne sont pas classés par l'ESRB". Knowing how Nintendo has been pretty careful with what they are saying about the Wii U and even certain games being developed for it, gives me slight hope that they are preparing one last big Wii U online detail reveal. I hope they detail the key features of the system such as Miiverse, multiplayer, patching, eShop prices, accomplishments, the friend code situation, and things like video chat and voice chat features. I hope that New Super Mario Bros. U features some form of online co-op, or even a Mario platforming multiplayer battle mode of some sort. 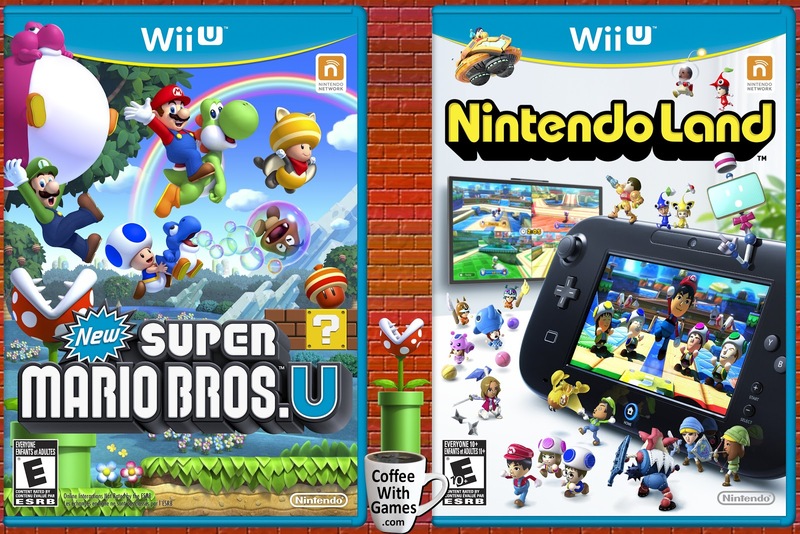 Even if it doesn't though, I already have NSMBU pre-ordered (for Bean 1), so we should be playing it together as a family this holiday season at the very least, and maybe even with some of you if there is online multiplayer of some sort in the game. I think it more likely that "online interactions" comment has to do with MiiVerse interaction (popups, achievements etc) and DLC than online multiplayer. Nintendo almost certainly would have mentioned if there was online multiplayer in this game. They haven't really mentioned online in any game though. Not even Black Ops II when it was shown, they just kind of skimmed over it and talked about the local splitscreen option. 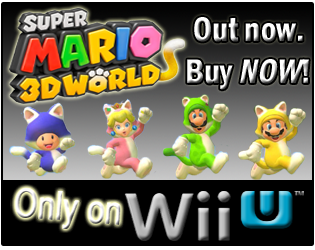 Also, with Nintendo Land having Miiverse, like, how is that different than what NSMBU has? That's why I find it interesting in the difference there, and odd. Both have Miiverse, but only one has the text about "online interactions". Maybe with Miiverse, all games will end up with the default text moving forward. I just hope they address the online stuff in a detailed manner when they do it, and not just a generalization. Or, at the very least, be able to answer any questions then about launch games. Yes, that's a show stopper for me. I want to play Mario online coop with my brother. If this is not possible this game has failed for me (I think I'll buy it either but don't tell my broter ;) ). I'm just wondering if they are holding off on the online announcements because they are still preparing/finalizing the games that will have online, Miiverse, etc. 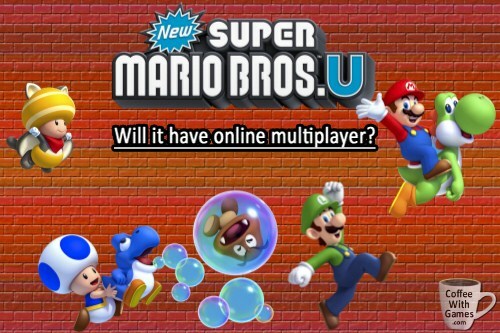 Playing Super Mario multiplayer online will surely rise up there sale for a lil bet and will bring much more enjoyment to the avid players of the said game. 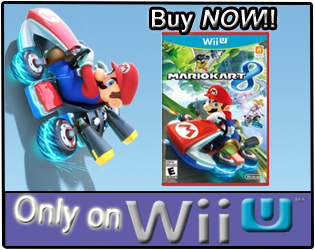 I agree that it would probably help sales for the game, and more importantly the Wii U system itself. What system can you play a 2D Mario online with friends? Well, hopefully that answer will be "The Wii U"...this year, and not in another 3-5 years. Even adventure Games http://www.newrealgames.com/ help build creativity because they require players to customize their characters in unique and interesting ways.